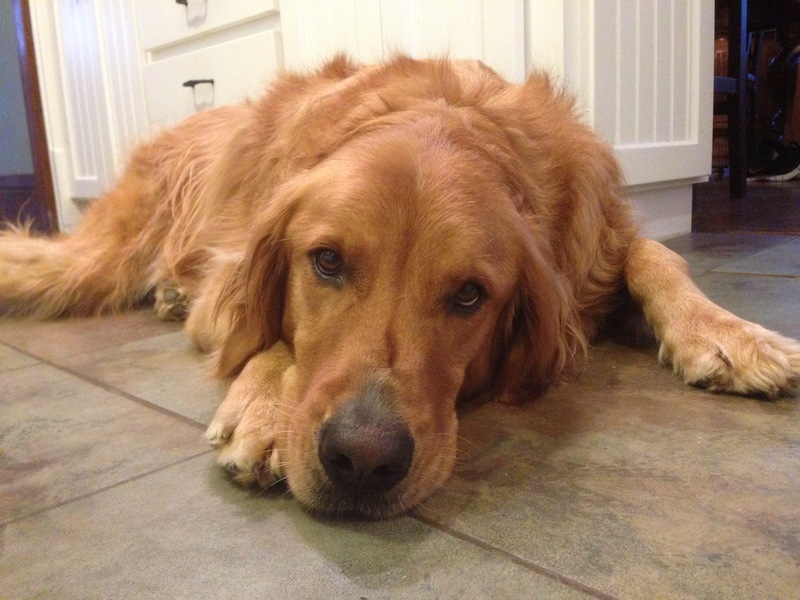 This gentle soul is Ernie, a highly intelligent three-year-old Golden Retriever who I worked with a few years ago. His guardians reached out to me to help stop a few new issues; running into the street when he sees another dog and not dropping the ball when playing fetch. We started the session out in the back yard of their home. Their back yard is not currently fully enclosed by a fence which is why they needed help in stopping Ernie from rushing to meet any dog he sees passing by his home. Ernie’s guardian had taught him how to fetch the newspaper for their neighbor and he diligently went to the sidewalk to get it so he could drop it at his neighbor’s back door. Because he was so adept at this, his guardian was confounded when Ernie suddenly stopped dropping the ball when playing fetch. Instead he would stand there with the ball in his mouth. I pulled out some high value treats and offered one to Ernie by holding it right in front of his nose. In order to take it, Ernie had to drop the ball out of his mouth. The second he did, I popped the treat into his mouth and repeated the “fetch” command word as he chewed. One thing I did not do was try to grab the ball as soon as he dropped it. When you do this, it puts the dog into guarding mode. Instead I simply stepped on the ball while I kept my eyes and focus on rewarding Ernie. This way Ernie was keying on the reward, not trying to protect or require an item. I coached his guardians through the fetch technique I like to use. I start out by making the dog sit in front of me to wait. Ernie had started to run off in the direction he thought the ball would be thrown as soon as the person with the ball raised their arm. When Ernie did this for me, I pulled the ball down and told him to come back and sit down. Only once he was calm and remaining in place did I move to the next step. I held the ball up and told Ernie “we are going to play fetch,” then threw the ball while saying “fetch” at the same time. 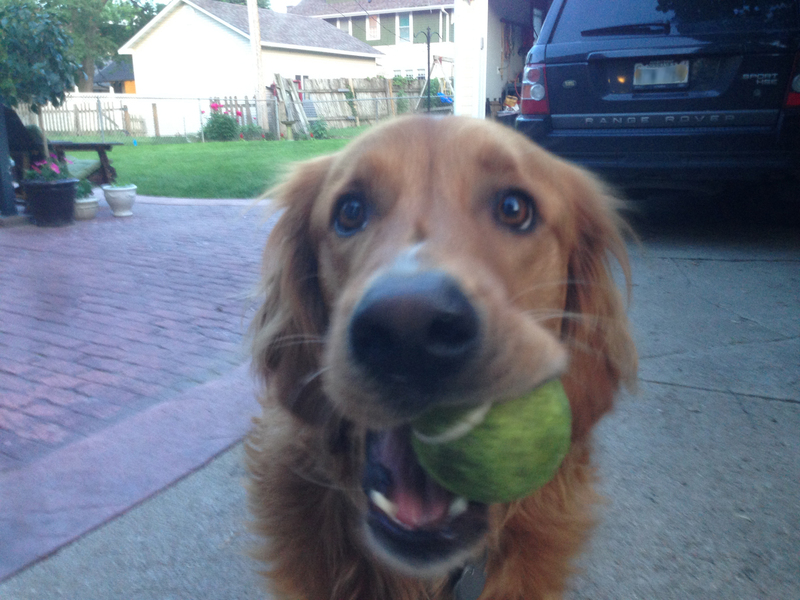 The second Ernie made contact with the ball with his mouth, I repeated the “fetch” command word again. 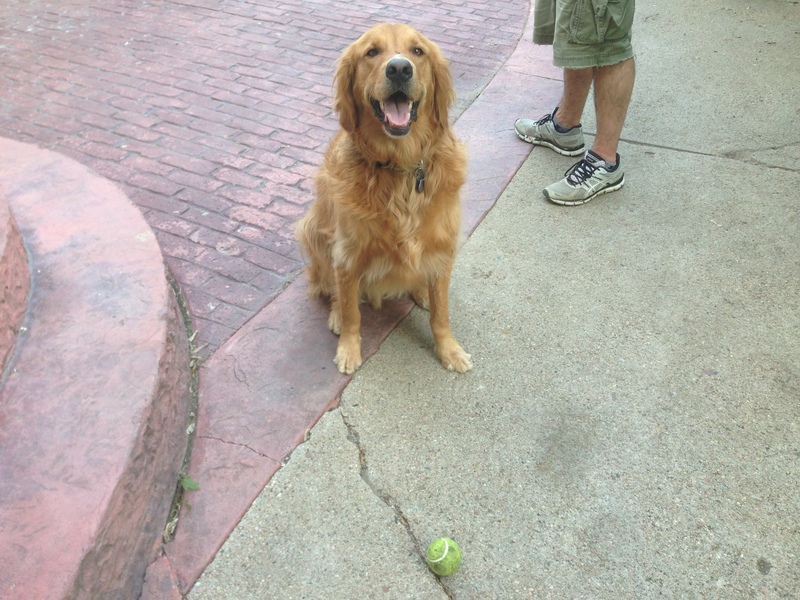 Once Ernie turned around with the ball in his mouth, he stood in place and stared at me. To communicate I wanted him to come back with the ball, I held my hand out with a flat palm facing up with a treat in my palm and crouched down into a squatting position while I faced the dog. As soon as I started to loved myself, Ernie started to trot over. By equating down, I made myself less authoritative to Ernie. By holding out the treat in a flat hand, I made it more appealing to him. I repeated this process a few times until Ernie started to come back without my crouching down. I grew the ball a few more times this way until Ernie started to drop the ball in front of me as soon as he returned from retrieving it. Each time he dropped the ball in front of me, I gave him the treat while repeating the command word “fetch” before I picked up the ball. I had his guardian take over and repeat the same procedure until they got the same results I was getting. It took about 15 minutes, but by the time we finished, Ernie was no longer bogarting the ball. As we were discussing the fetching exercise, Ernie spotted a dog walking in front of his house and started to take off. As luck would have it, I was between the dog and the street. Without thinking, I stuck my right leg out to the side and hooked it in front of Ernie which stopped him in his tracks. Because the leg hook was more of a spur of the moment thing, I gave his guardians a few things to work on to help stop his rushing towards any dog he sees. One of these was teaching the dog to look up at their faces when they give him a “eyes” command. They will need to start out by practicing this exercise without any dogs near by. Once they have mastered it, they will be able to increase the level of difficulty until the dog develops the skill to immediately shift his attention to the person giving him the command. Once this is the case, they will be able to use it to redirect Ernie’s attention when he sees another dog near by. I also went over a few other exercises that will help them practice getting Ernie to respect boundaries and restraining himself. Combined with the eyes exercise, Ernie will be less reactive to the sight of another dog and start looking to his guardians for leadership and direction when he sees other dogs in the future. By the end of the session, Ernie was showing more respect for his guardian’s personal space, was retrieving the ball and dropping it without any fuss and was adhering to any corrections offered by his guardians. It will take practice at the eyes command and other exercises before Ernie stops bolting at the sight of another dog. But because of how smart he is and the determination of his guardians, I suspect it wont be long before Ernie looks to and waits for permission from his guardians before bounding after dogs passing by his house.